Minister of Homeland Security Nicholas Dausi and his deputy Charles Mchacha visit flood victims. 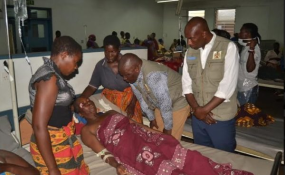 Lilongwe — Some 28 people have been killed and 11 missing following heavy rains in Malawi. At least 29 others have been injured following the inclement weather. More than 120 000 people have been displaced. The affected families are staying in makeshift sites in schools and churches with limited or no access to food, clean and safe water, and access to public health services. Families are in dire need of food, shelter, water, hygiene and sanitation, livelihood, protection, gender and inclusion services, according to the Red Cross. The international humanitarian organisation this past weekend distributed assorted relief items worth K18 million (R356 000) to the displaced people. "Our priority focuses on immediate needs of the people in the camps. We want to ensure that they restore livelihoods and human dignity," said Prisca Chisala, Red Cross Programme Director. Meanwhile, Civic Education, Culture and Community Development Minister, Everton Chimulirenji, has called on all stakeholders to refrain from indulging in any malpractices in the provision of relief assistance to people affected by recent floods and heavy rains. "All stakeholders should ensure honesty and impartiality in the provision of relief assistance to the affected people," the minister said. The Department of Disaster Management Affairs is coordinating and providing relief assistance in affected districts.